Facebook and Edmunds are partnering to allow the listing of used car inventory from Edmunds dealers directly on Facebook Marketplace. Used cars are among the most popular listings on Facebook Marketplace, and collaborating with Edmunds allows Marketplace to expand their used car inventory, give shoppers a larger selection and directly connect dealers with local buyers, according to Edmunds. Since Facebook launched Marketplace in late 2016, individuals could list used cars for sale and the platform already features a dedicated vehicles category that lets users search by make, year, mileage and price. The partnership is one way Edmunds is keeping ahead of the digital curve and building connections between ready-to-buy shoppers and dealers, said Nick Gorton, vice president of product innovation at Edmunds. “Bringing real-time, used-car inventory to Facebook Marketplace not only streamlines the car buying process for millions of users, but also is an exciting step on the path to bring more components of car shopping online,” Gorton says in a release. 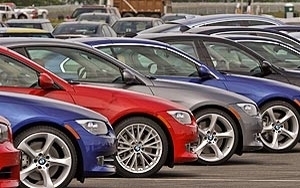 The move will allow Edmunds dealers to reach millions of potential new buyers. Through Marketplace, dealers can more easily connect with shoppers where and when they are searching for vehicles, and communicate with them directly in real time using Facebook Messenger. Marketplace users in the U.S. will be able to browse inventory from local auto dealers and filter listings by year, make, model, mileage, type and transmission. It also allowed them to communicate with dealerships in real time via Messenger. Inventory from 4,000 Edmunds dealers (about 330,000 listings) is live on Facebook Marketplace now, with plans for more to be added in the coming weeks.